A KAKIEMON VASE AND COVER OF THE FORM KNOWN AS "HAMPTON COURT VASE"
The earliest account of such jars is to be found in an account of a sale in Holland in 1680 "The red assortment was much desired. 36 show pots for cabinets, cost price 2 florins, nine s. sold at Enkuisen for 140 florins" (the reference to red assortment was the term used for polychrome decorated vases in the 17th century). The above jar is a particularly rare example of the Hampton Court type, being somewhat higher than the other known examples. A similar pair sold December 2, 1980 in these Rooms, which were known to have descended from King William IV to his illegitimate daughter the Lady Augusta Fitzclarence, and it is probable that these came from the Royal Collection. Some porcelain from the original collection has been dispersed, since after Mary's death a proportion was left to Arnold Joost van Keppel, 1st Earl of Albermarle, but several examples including similar pairs are still at Hampton Court with others in the Royal Collection at Buckingham Palace and Winsor Castle. Further similar examples are in the Johanneum at Dresden formed by Augustus the Strong, King of Poland Elector of Saxony between 1694-1705 and Woburn Abbey. 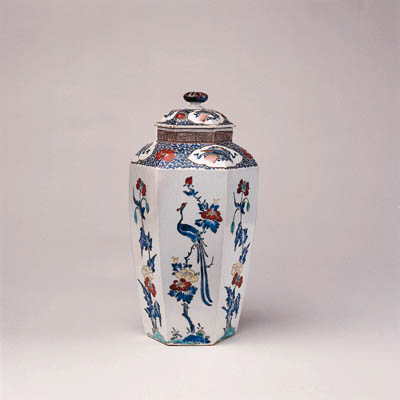 A similar vase and cover in the collection of the Victoria and Albert Museum is illustrated in Sekai Toji Zenshu, vol. 8, no. 37. Two others are also illustrated in Nihon Toji Taikei, vol. 20, Kakiemon, no. 38 and in Nihon Toji Zenshu, vol. 24, Kakiemon, no. 43. A similar Kakiemon style jar of Chelsea manufacture dating c. 1753-55 is illustrated in Porcelain for Palaces, The Fashion for Japan in Europe (1650-1750), pl. 196.